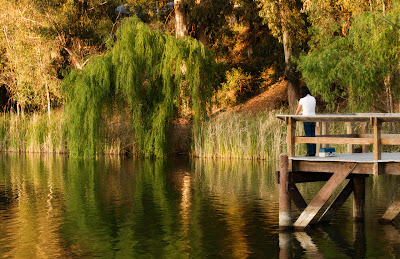 Kim wanted to do some fishing last night, so after quickly wolfing down our dinner we went down to Vasona County Park, where they have a fishing pier. The county supposed stocks trout here every here and at dusk we sure saw many splashing in the water. Technical Specs: Canon Rebel XTi, 70-200 f/4 IS @ 70mm, f/5.6, 1/50s, ISO 200. Have you seen it recently? I took a picture of the same place this weekend and mashed it up with your picture.